Symphony meets the diverse market data and exchange connectivity solutions needs for banks, hedge funds, trading houses and exchanges. We build most reliable market data feed handler and order gateway solutions for firm to drive trading strategies, inform decesion making and optimize performance. We offer a range of leading connectivity and feed solitions to support the data you need. Our solutions are offered as self-managed applications or may be deployed with Symphony Managed Service expertise. 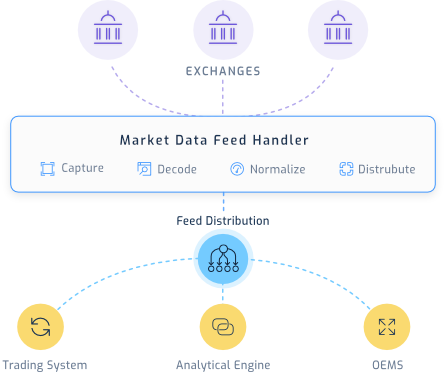 Our market data feed handlers are software solution allow a trading firm to consume low latency feed data into their trading decesion system to exploit the best trading and execution opportunities in the market. We build most reliable market data feed handler and order gateway solutions for firm to drive marketdata strategies, inform decesion making and optimize performance. We offer a range of leading connectivity and feed solitions to support the data you need. Our solutions are offered as self-managed applications or may be deployed with Symphony Managed Service expertise. Our market data feed handlers are software solution allow a marketdata firm to consume low latency feed data into their marketdata decesion system to exploit the best marketdata and execution opportunities in the market. Our Feed Handler Solutions is a software based consolidated feed enables high precesion capture, decode and delivers normalized, low latency market data in a way to your trading application needs. Our consultant delivers a optimized Feed handler and Exchange conectivity solutions of your desired markets to save lot of money you incur on vendor licenses. We provide an easy to use powerful market data and trading API solutions to financial Institutions to let their traders and Quants to integrate or build own trading application that best meets their specefic requirements. Our API solution offer real-time level-I, level-II data, historcal data, news and analytics to be effortlessely integrated into your trading application. Our NodeJS based market data solution allow to dissiminate the real-time normalized market data to thousands of retail clients. Symphony delivers managed service for TBT market data feed handler and trading platform as a "Co-location As-a-service" for small and mid size NSE exchange trading members for ulta low latency trading and market data access technology. We also provides a proximity hosting services of other Indian Exchanges. Symphony team are experts in the design, delivery and support of IT systems for handling Financial Market Data. Symphony project teams or individual specialists work with clients on their Market Data projects to build bespoke systems or solutions based on Symphony range of financial market data handling software products with fast time to the market. Market Data Consultancy services dealing with your market and reference data intelligence needs for easy and efficient normalized market data access to your trading system.